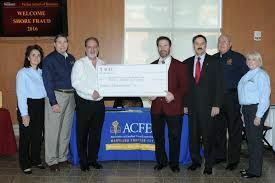 Each year the Chapter may provide one or more scholarships to a student or students at Maryland institutions of higher learning with forensic accounting or fraud prevention programs. Academic advisors in these fields at schools such as Stevenson University and Salisbury University can provide details for their students. Besides awarding scholarships, the Chapter has provided funds for anti-fraud libraries at Salisbury University, Stevenson University, and the University of Baltimore. Each year the Maryland Chapter offers up to two scholarships for eligible members who wish to take the ACFE test and attain their CFE designation.The following are the requirements for eligibility and the process involved. Must be a member of Maryland Chapter #21 ACFE, in good standing (paid up dues and at least 1 meeting attendance), for one year. Submit your application and your current resume/curriculum vitae. Attach a short essay (one page or less) on why you should be considered for the Scholarship. Attach two letters of reference from CFE’s who are Chapter Members in good standing. Certify (one or two sentence word doc) that you are an Associate Member ACFE in good standing (paid up dues) with the National Association. Certify (one or two sentence word doc) that you have been a member of the Maryland Chapter for at least one year prior to your application. Must sign a Contract of Agreement with the Maryland Chapter stating that you agree to complete the Scholarship Study Guide and successfully pass the CFE exam within one year of receipt of materials or forfeit the scholarship and reimburse the Chapter the cost of the ACFE Exam Prep package. Awardee will have to submit a valid personal credit card account number on the contract. Public announcement of awardees will be made at the Chapter meeting November, 2019. Eligibility for scholarships is governed by state and federal ethics requirements. All applications and required documents are to be submitted to the Scholarship Chairperson: MDACFE@gmail.com. All application packages are good for one year only. If previous applicants were not selected in a given year, an entire new application package needs to be resubmitted for the next year, if so desired. See our awards page for recipients of the Hohenstein Fraud Fighter of the Year Award.